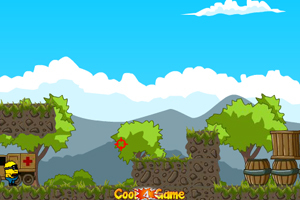 Use arrow keys to move and mouse to shoot the enemies. Save your friends at the mall by taking out waves of zombies. Racy is your pet，it is a lovely Panda, you must take care of it! There are many beautiful clothes in the supermarket, you have to get more and more gold, then you can buy clothes, decoration for it, you can also buy a lot of food to feed it. From now on You should get more and more gold and buy better clothes and food for it. Lisa is a famous fashion style master ，she has a certain reputation in china! Today Lisa is very happy ，because she received an invitation for The World Fashion Stylist Compitition. She decided to prepare for it and put down all the work of hers! You must help Lisa as her assistant. It's getting closer to the Compitition ,we hope that lisa will the Fashion Stylist Compitition! Launch your grapple underground and grab enough gold to progress to the next level. Buy powerups. Be amazed by the new game that gives you all the best features of Arkanoid and Space invaders. Collect powers to improve your ship and succeed in passing the 20 levels by destroying alien ships. Use the mouse to fire and move your ship. Be a shop assistant of a footwear shop, decorating this shop in the way that you like, and placing the exhibitors and the furniture that you want... Use the mouse to play. Explore the sweet and colourful worlds of candies and ice creams in this fun racing game. It's place where you’ve never seen them before! Pick up the bonuses (rockets, bubbles and jelly) and use them to your rivals. Finish first, complete different missions to win a level. Remember! Your car so tasty! Don’t stop! Dangerous crocodile can eat you! This Chibi Magical Creature can look like a cute Disney princess is a mini fantasy version so play this fun game and dress her up! You can start by choosing your favorite Chibi Princess. Then you can choose for her a new hairstyle, create a fabulous outfit mixing and matching tops and bottoms. Your magical creature can become a mermaid, a faun, she can be half pony or half tiger, or she can remain a Chibi human princess. Now all the Chibi Magical Creature needs is an adorable pet to keep her company. There are so many exciting possibilities in this lovely game! Have an incredible time! There are five completely different persons who are unique in some way. Each of them will try to reach the finish line first. Make sure you are the one who do it. Choose your hero and see what you can do. Activate various things in the lab using your battery. Deliver it straight to the charger and collect as many cogwheels as you can. The success if dino rescue mission depends on you. Collect all meat you see around and work together to reach places, that were locked for you before. Enter the cave and reach maximum points at the level. How many bullets you will need to stop the invasion of zombies? Well, considering the fact, that you are a cool penguin it seems like it won't be a problem. Kill all zombies using less ammo! Ninja turtles never leave people in troubles, so they will do everything possible to save hostages and punish their enemies. Collect breads and watermelons to use them against thugs and the obstacles ahead. Dragon Ball Fierce Fighting v2.1 has added Vegeta and Freeza, two new characters. Special character can fly. Dragon Ball Fierce Fighting is going to come to an end. Play the game right away to defeat the big devil king! A new challenge for luffy is about to begin and he must practice a new skill. Let’s help him practice boxing to be a winner! Spongebob：To collect all food, don't be caught by the enemy. The crab：Stop the Spongebob collect food, responsible for the arrest of Spongebob. Mermaid helper：Capture of Spongebob. Press the Z to open the door. With the magic aperture door open release of shock wave, You can attack the enemy. The rubber band can help jump,but the rope after the red must leave, Otherwise it will break. Orange floor will make people fall. Spongebob to gather food. Dora the explorer is going on a new adventure to collect fruits! Please help her collect all and avoid monsters! Description Episode two of Shaun the Sheep’s official gaming adventure, Home Sheep Home 2. Help three sheep find their way through underground caverns and return safely home. Use each of their unique abilities to overcome obstacles and solve puzzles in this epic physics based adventure. If you enjoyed taking the sheep through underground caverns, visit www.homesheephome2.com for more great episodes on PC, iPhone, iPad and Mac. Welcome to MixiPlay, the number one place on the Internet to find the free flash games to dazzle your eyes and blow your mind! We've got tons of Popular Games from all over the web, and with brand spanking New Games coming in every week, there's no way to ever be bored at princess Games!